Sandra Larson, director of the Iowa Department of Transportation's Research and Technology Bureau, is responsible for planning, developing and implementing research and ITS programs. She chairs the American Association of State Highway and Transportation Officials' Research Advisory Committee and the National Cooperative Highway Research Program's IDEA Committee. She spoke with Innovator about the Iowa DOT's innovative culture and how it meshes with the philosophy of the Highways for LIFE initiative. Why is it so important for highway agencies to innovate? We are all dealing with so many challenges, whether it's funding, traffic, the economy or the needs of the public. Challenges and opportunities surround us. Innovations can help us meet those challenges and provide effective solutions. The Iowa DOT is known for its innovative culture. How does the Highways for LIFE philosophy of setting customer-focused performance goals and using innovation to meet them fit into the Iowa DOT's way of doing things? The Highways for LIFE goals and principles overlap what Iowa's been doing for a long time. In fact, Iowa's Highway Research Board has existed for 59 years. While Minnesota has a similar group, their focus is on city and county research interests. In Iowa, the board consists of representatives from the cities, counties and state, as well as Iowa universities with engineering programs. The board funds research that covers a cross section of interests, providing a culture of innovation that's worked well in Iowa for a long time. How did innovation become an integral part of the Iowa DOT culture? When something you do works, and works well, you keep doing it. In fact, you do more of it. Iowa certainly has had that experience with innovation. For instance, the first slipform paver was invented, manufactured and used in Iowa more than 50 years ago. The Iowa DOT has a culture of partnering within its own organization, as well as with other states and agencies, local governments, universities and industry. So when we're talking about innovation, whether it's in the areas of paving, bridges or geotechnical, we have a culture that works well in coming up with ideas, vetting those ideas and carrying them forward to implementation. 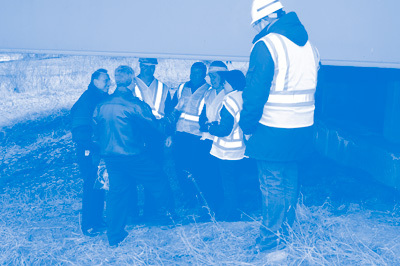 An example of innovation at work is the Intelligent Construction for Earthworks Workshop in April 2009, which is sponsored by the Iowa DOT and Earthworks Engineering Research Center at Iowa State University. This will be the second workshop on this topic, and other state DOTs, the Federal Highway Administration, universities, city and county engineers, and industry representatives are invited to attend. The purpose of the workshop is to discuss intelligent construction, specifically what it entails, including the advantages and challenges. Iowa is trying to promote awareness and increase knowledge about this very important and emerging research area. Why is it important to involve highway community colleagues from outside your state in the workshops? It's not altruistic. We think what helps others helps us, and what helps us helps others. It's like the old saying: "A rising tide lifts all boats." I am committed to the idea that partnerships, discussions and debate help us all achieve more. And what we end up implementing has been not only tested, but hopefully had the bugs worked out as well. Does the Iowa DOT use any processes or incentives to encourage innovation within the agency? No, it's just the way we work. It's intrinsic in the Iowa DOT's culture and a big part of my job description. I cannot overstate how open-minded people are that I work with. We're all trying to come up with innovations that will advance what we're doing, are practical and will make a difference. Change is always something to keep focused on. And innovation is change. It's been part of the Iowa DOT's culture for a long time. I wouldn't go so far as to say Iowa is unique or that we're the best. You can never rest on your laurels when it comes to change and innovation and improving how you're doing. So while it has been a part of our culture, it's something to always be putting energy toward. How did you develop the Highways for LIFE project you did in Iowa-using precast concrete deck panels and other innovations to speed up reconstruction of a bridge in Council Bluffs-and what did you learn from the project? The Iowa DOT had been discussing potential projects internally and with the Associated General Contractors for about a year and a half before the Highways for LIFE program was announced. I attended all the Transportation Research Board's sessions on Highways for LIFE leading up to the announcement and had a pretty good idea of what the program entailed. So we had our project selected and submitted shortly after the announcement was made. In my opinion, the most important thing we learned as a result of the Highways for LIFE program was not technical; rather, it was how we worked together in identifying the most promising project, and how we were able to combine promising technologies with safer construction practices to produce a long-lasting structure. What advice would you offer colleagues in other states about adopting and using innovation? Focus on the end goal. It will help determine what innovations and research are going to pay off. In the beginning you may not know exactly what the payoff will be, but having a goal helps you focus. For instance, Iowa's research efforts are focused on four key areas: safety, structures, pavement and winter maintenance. Another emerging area is geotechnical research. While research is being performed in other areas, these areas remain dominant because they are so important to our business. Although we're doing a very good job in these areas, we think there's always room for improvement. I'm not a proponent of doing something new just because it's new. I'm interested in doing something new because it's better. That's what has to be the innovation driver. And I don't want to do anything that's just stand-alone research. Time, money and expertise are so precious that, to me, once you start you need to push forward to implementation. It doesn't mean that what you started with is exactly what you end up with. It's more of a process of discovery. We want to put all of our efforts and energies into making things better, longer lasting and safer. For more information on the Iowa Highways for LIFE project, see "Innovations Speed Iowa Bridge Construction" at www.fhwa.dot.gov/innovation/innovator/issue09/index.cfm#a5. The design-build delivery method is slashing years from the completion date for the $245 million Interstate 29/35 reconstruction project in Kansas City, Mo., known by the catchy moniker "kcICON." "We probably will save four to five years compared to the conventional design-bid-build process," said Jim Shipley, deputy project director for the Missouri Department of Transportation. "While we were engaged with proposers during procurement, we were buying right-of-way. Normally you buy the right-of-way first, then go into procurement." The selected designer-builder is adhering to an aggressive schedule for the four-mile-long (6.4-kilometer-long) project. In December 2007, the Missouri DOT signed a contract with Paseo Corridor Constructors-a joint venture composed of Clarkson Construction Co., Massman Construction Co. and Kiewit Construction Co.-and in April 2008, construction began. While construction got started, Paseo Corridor Constructors was working on design. By December 2008, the design of 11 grade-separation bridge structures was complete. The project also calls for a landmark cable-stayed bridge over the Missouri River. Construction was well under way on the 1,610-foot-long (491-meter-long) bridge before its design was finished, and in February the project was on schedule for completion by July 2011. For its innovations in project delivery and construction, the Missouri DOT won a $1 million grant from the Highways for LIFE initiative to accelerate innovation use. The kcICON project, one of the Missouri DOT's first three design-build projects, uses a new model for the process, Shipley explained. The project scope was not precisely defined when procurement of the designer-builder began. "During procurement we set a fixed price and asked the proposers to tell us what improvements they could give us for that amount of money," Shipley said. "That allowed the proposer teams to compete against each other to determine which team could give us the most scope for the money. We laid out the various elements that would be scored in the awarding process, so they knew what our priorities were." Meet the total program budget of $245 million. Build a Missouri River bridge that could provide a century of useful service. Maximize safety, mobility, aesthetic and capacity improvements in the corridor. Engage stakeholders and the community to successfully develop and deliver the project. Meet or beat the project completion date of Oct. 31, 2011. To judge the design-build proposals, the agency created a 100-point system that assigned a weight to each goal. For example, project definition-directed at goal 3-was worth 30 points; that involved geometric improvements to lanes and interchanges. The method of handling traffic during construction was worth up to 15 points, the time of completion schedule was worth 10 points, and the aesthetics of the landmark river bridge was worth 20 points. Other areas were development of economically disadvantaged persons' skills (10 points), bridge durability (10 points) and public information program (5 points). The landmark bridge will have one large pylon, located close to the center of the river, to support a 550-foot (168meter) navigation span and a 450-foot (137-meter) backspan. The north approach is 465 feet (142 meters) long and the south approach is a single span of 150 feet (46 meters). The designer-builder is implementing a number of innovations, said Tom Skinner, the Missouri DOT bridge engineer for the project. An example is drilled shafts that use slurry instead of steel casings to support the shaft walls during drilling. When drilling of a shaft is complete, the contractor inserts a 100-foot-long (30-meter-long) rebar cage, with a base plate, into the hole. Attached to the rebar cage is a tremie tube-an apparatus for depositing and consolidating concrete under water-that reaches from the top to the base plate. Concrete is pumped into the shaft. After it cures, the contractor pumps grout through the tremie tube into the base of the column to fill up voids in the sand around the base. "This drilled shaft method saves us money," said Skinner. "Steel casings are very expensive, at $50,000 each. We saved more than $1 million, plus we didn't have to wait for steel casings to be fabricated and delivered to the project site." To learn more about the project, visit www.kcicon.com. On the Utah Highways for LIFE project, a post-construction survey showed that customers were pleased with the construction approach and final product. A new Highways for LIFE report shows that a Utah Department of Transportation project that used innovative technology to replace a bridge superstructure over Interstate 215 in a weekend met performance goals for safety, construction congestion and customer satisfaction. 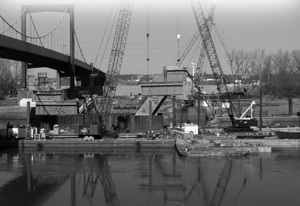 The bridge project, which received a grant from the Federal Highway Administration initiative to boost innovation, used accelerated bridge construction techniques to reduce the impact of construction congestion on motorists from months to days. Because of its success on this and other ABC projects, the Utah DOT plans to make ABC standard practice for bridge construction by 2010. The new superstructure was constructed off-site and the new substructure was built under the existing bridge while traffic continued to roll. The existing superstructure was removed and the new one was moved into place in a weekend with a self-propelled modular transporter, a computer-controlled vehicle that transfers heavy loads with great precision. The report, Utah Demonstration Project: Rapid Removal and Replacement of the 4500 South Bridge Over I-215 in Salt Lake City, looks at how well the project met the performance goals Highways for LIFE recommends for projects that receive funding. Safety, construction congestion, quality and user satisfaction data were collected before, during and after construction to demonstrate that ABC technologies can be used to achieve goals in these areas. No worker injuries or motorist incidents were reported during construction, which means the Utah DOT exceeded the safety performance goal. And no motorist incidents have been reported since the project was finished. Innovation significantly sped up construction and reduced its impact on motorists. If the project had been built using conventional techniques, construction-related congestion would have lasted 40 to 50 weeks. Using ABC techniques reduced traffic impact to a weekend for I-215 and 10 days for State Route 266, on which the bridge is located. To evaluate the project's success in meeting quality goals, on-board sound intensity testing was used to measure tire-pavement noise and a laser profiler provided a pavement profile from which an International Roughness Index value was determined. After construction, tire-pavement noise was marginally higher-95.3 decibels compared to 95.1 decibels before construction. But the roadway's final riding surface had not yet been placed, and both pre- and post-construction levels met the project noise performance goal of less than 96 decibels. Preconstruction IRI for the bridge deck was 223 inches per mile, and post-construction IRI was 265 inches per mile. Adding the final riding surface was expected to bring the post-construction IRI closer to the preconstruction measurement. That would still fall short of the Highways for LIFE goal for IRI of 48 inches per mile-a reasonable goal to meet on long pavement stretches, but difficult on a short-span bridge like Utah's because of the bumps at each end of the structure. A post-construction survey found that 92 percent of area residents and businesses were satisfied or very satisfied (6 or 7 on a 7-point Likert scale) with the Utah DOT's and the contractor's performance on the project. About 94 percent were satisfied or very satisfied with the project results. That means the Utah DOT far exceeded the goal of 4-plus points for customer satisfaction with a construction project. A key aspect of Highways for LIFE projects is quantifying the value of using innovation. That involves comparing the benefits and costs of the innovative project delivery approach with those of a more traditional approach. On the Utah project, the net savings were about $3.2 million. Using traditional construction methods would have cost the Utah DOT about $800,000 less than using accelerated construction techniques. But using those innovative techniques drastically reduced the impact of the construction congestion on road users, resulting in user cost savings of $4 million. This advertising poster is requesting performance contracting project submissions to the Highway for LIFE program. A long length of bridge is shown with the words "Leaders Wanted-Become" a Pilot State." Performance contracting, an innovative new project delivery method, was the focus of a Web conference sponsored by Highways for LIFE in cooperation with the National Highway Institute. Highways for LIFE and NHI are partnering on "Innovations," a free monthly series about innovative highway construction practices and technologies. Registration for future conferences and recordings of past sessions are available at www.nhi.fhwa.dot.gov/about/innovationseries.aspx. Performance contracting is a contracting method in which the highway agency defines the project goals to be achieved and the contractor is given flexibility in how to achieve those goals, explained Mark Robinson, Science Applications International Corp. vice president and a Web conference presenter. A primary benefit of performance contracting is that it encourages contractors to innovate, Robinson said. When goals are defi ned and contractors determine how to meet them, both the agency and the contractor can share in the risks and rewards. This approach requires a culture shift, he added. Contractors have choices on and control over construction methods, and agencies, in turn, must give up some of that control, he said. With performance contracting, the low bid is not necessarily the optimum procurement method. "We encourage agencies to award contracts based on best value, not just price," said Robinson. Best value was the procurement method used to select Central Asphalt, the contractor that reconstructed 5.5 miles (8.8 kilometers) of M-115, a two-lane rural road in Michigan, Tom Fudaly, engineering and operations manager for the Federal Highway Administration's Michigan Division, said in the Web conference. Point values, or weights, were assigned to each goal, up to a total of 120 points plus 30 points for innovations. Pavement performance, for example, was given 50 points. And the state required a five-year performance guarantee, or warranty, for the new roadway. Incentives and disincentives were included in the contract based on how well the contractor achieved the goals as measured. When the project was complete, the contractor achieved nearly the maximum amount of incentives that the Michigan DOT offered-$450,000. "We figured our potential incentives into the contract in order to make the numbers work," said Johnson. Performance contracting resulted in a number of innovations. An important one was a temporary travel lane for use while the road was under construction. That way, traffic could move through the project in both directions at all times, minimizing delays. The contractor would have been penalized for excessive traffic delays on M-115, a heavily traveled tourist route. Plus, Johnson said, the temporary lanes gave the contractor time to do another change proposed from the original method envisioned by the Michigan DOT: the removal of existing asphalt and the rubblizing of the underlying concrete before placement of an asphalt overlay. Rubblization prevents joints in the concrete from reflecting upward through the asphalt overlay. "We believe that enhanced the value of the new pavement," said Johnson. Upcoming "Innovations" sessions include "Safety Edge" on May 6 and "Pavement Smoothness" on June 10. Editor's note: After the Web conference, we learned that the FHWA family had lost one of its own: Tom Fudaly passed away unexpectedly on Feb. 20, 2009. He had been with FHWA for 33 years. We're passing this information on for those in the highway community who were among his many friends. A Technology Partnerships grant is aiding the development of AIMS, a new device to characterize aggregates used in paving materials. A Federal Highway Administration grant is enabling 32 laboratories, most at state highway agencies, to test a new system that automates the process of measuring aggregate characteristics that affect pavement durability and safety. The lab tests are part of a Technology Partnerships project to refine a prototype of the aggregate imaging measurement system, or AIMS, developed by Pine Instrument Co. of Grove City, Pa., and make it a marketable product. The Technology Partnerships Program, part of the Highways for LIFE initiative, provides funds to private industry to test promising technologies that enhance highway quality and safety or cut construction congestion. Research shows that the characteristics of aggregates used in hot-mix asphalt and other paving materials affect the structural integrity and durability of pavement systems and the skid resistance of pavement surfaces. Those characteristics include shape, such as round or fl at, and texture, the smoothness or roughness of the particle surface. "The current methods used to characterize aggregates are subjective and time consuming," said Dave Savage, Pine Instrument's director of sales and marketing. "AIMS provides objective characterization of aggregates, which will provide more consistency." Originally designed as a research system, AIMS combines hardware that captures digital images of aggregate samples and software that analyzes the characteristics of those samples. Pine Instrument reconfigured the components of the prototype's hardware system and enhanced the analysis software to make results easier to interpret. One change was the addition of doors enclosing the testing area to limit ambient light, which affected the performance of the AIMS prototype. The redesign also made the system easier and less expensive to manufacture. The redesigned prototype went through two rounds of testing at Texas A&M University, a project partner. The first round evaluated whether the new design met system performance requirements. The tests showed that most of the new system's outputs matched those of the research version, and researchers made adjustments to resolve a few differences. The second round of tests evaluated the "ruggedness" of the testing procedure, or the ability of the testing methodology to handle small variations in the parameters used to capture data-not, as it may sound, the ability of the equipment to stand up to abuse. Through the study, researchers determined that some parameter settings required fixed rather than user-adjustable values to assure ease of use. The ruggedness study also found that ambient light continued to affect system performance. The doors were changed from a translucent to an opaque design, and more tests confirmed that the switch improved the performance of AIMS. The next step is establishing the precision and reproducibility of the AIMS methodology. Thirty-two laboratories were recruited to evaluate the refined AIMS equipment and procedures. Many signed on at the encouragement of Thomas Baker, state materials engineer for the Washington State Department of Transportation and an early champion of the technology. In this test, now under way, Pine Instrument is sending eight AIMS devices to four laboratories each. 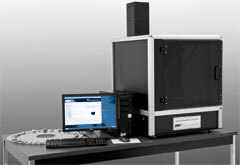 The labs are testing three aggregate samples-measuring each sample twice, on different days, with the same operator. Texas A&M University will analyze the resulting data. "The study provides the multiple laboratory and user data that are used to determine the precision and bias of the test procedure and equipment," said Matthew Corrigan, manager of FHWA's mobile asphalt materials testing laboratory, a study participant. The goal is a market-ready tool that accurately and rapidly characterizes aggregates. Such a tool would offer an automated method of qualifying aggregates to meet construction specifications, ensure pavement performance and enhance roadway safety. The number of labs participating in the test is an indication of the highway community's interest in the technology, Corrigan and Savage said. "We're very happy with the amount of interest we've received," said Savage. "It comes back to the fact that people are not satisfied with existing methods for aggregate measurement and classification. They're looking for a better way." For more information on Technology Partnerships, visit www.fhwa.dot.gov/hfl/partnerships, or contact Julie Zirlin at (202) 366-9105 or Julie.Zirlin@dot.gov. For details on AIMS, contact Dave Savage at (724) 458-6391 or dsavage@pineinst.com. An all-weather pavement marking system being tested under the Highways for LIFE Technology Partnerships Program won a 2009 Roadway Work Zone Safety Awareness Award from the American Road & Transportation Builders Association. The pavement marking system, developed by 3M, won in the "Innovations in Technology" category. The annual awards competition honors outstanding efforts that promote safety in roadway construction zones. An independent panel of judges selects winners based on criteria such as effectiveness, measurable results and value to the industry and public. 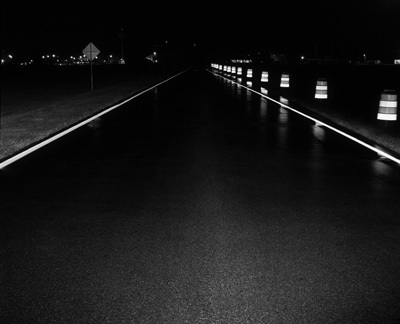 The goal of the 3M project is a pavement marking system that maintains optimal visibility in inclement weather and meets work zone requirements for fast application and drying times. For more information, visit www.fhwa.dot.gov/hfl/partnerships.